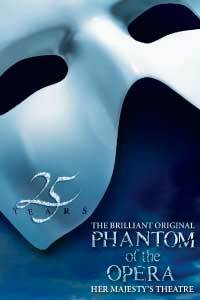 At 10:00 am on Monday 12th September a limited number of Phantom 25th Anniversary tickets will be released on a first come first served basis. Click on the link to book online. A limited number of tickets will be available in the Grand Tier and Loggia boxes for Saturday 1st October at 7.30pm and Sunday 2nd October at 7pm at £250 each. There will also be a limited number of stalls seats available at £180 each for both the Saturday evening and Sunday matinee performances. In addition there will be a limited number of gallery tickets released but they are standing room only and will be available at £25 each.